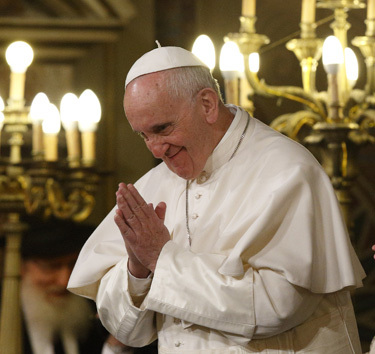 ROME (CNS) — While the Catholic Church affirms that salvation comes through Jesus, it also recognizes that God is faithful and has not revoked his covenant with the Jewish people, Pope Francis said. 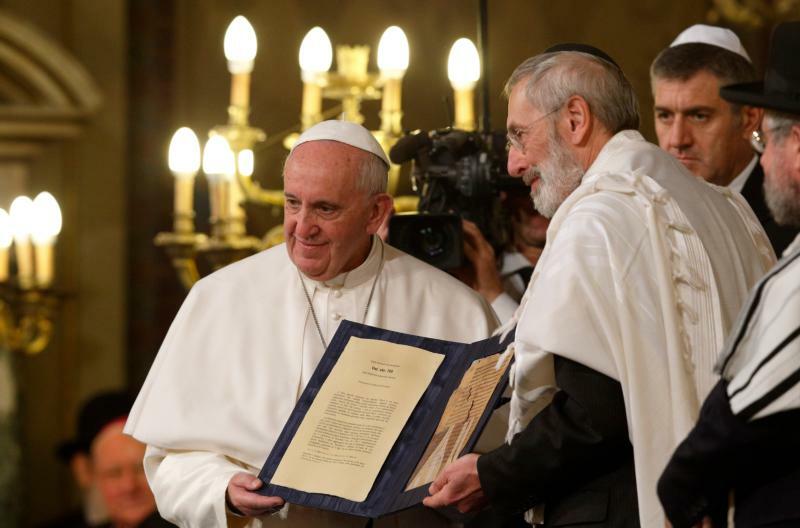 The statement, which he already had made in his 2013 exhortation, “The Joy of the Gospel,” was repeated in a recent document by the Pontifical Commission for Religious Relations with the Jews. The document reaffirmed Pope Benedict XVI’s teaching that the church “neither conducts nor supports” any institutional missionary initiative directed toward Jews. While frigid winter temperatures finally arrived in Rome, Pope Francis received the warmest of welcomes at the synagogue. The visit featured an exchange of standing ovations. 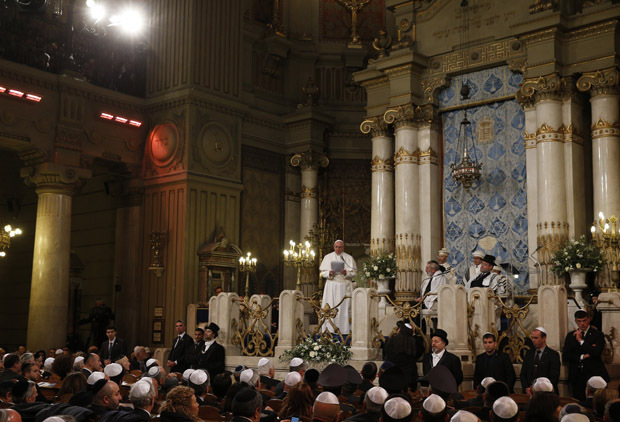 Members of the Jewish community greeted the pope on their feet applauding and bid him farewell the same way; he stood and applauded with the congregation when honor was paid to the handful of survivors of the Nazi Holocaust who were present for the event. The pope, the rabbi, the president of the Rome Jewish community and the president of the Union of Italian Jewish Communities all recalled the visits of St. John Paul II in 1986 and of Pope Benedict XVI in 2010. And they all spoke of the “new era” in Catholic-Jewish relations that began with the Second Vatican Council and its declaration “Nostra Aetate” on relations with non-Christian religions. But continued violence in the Middle East and the specter of terrorism also were on the hearts and minds of all the speakers. “Conflicts, wars, violence and injustice open profound wounds in humanity and call us to reinforce our commitment to peace and justice,” the pope said. “The violence of man against man is in contradiction with every religion worthy of the name and, particularly, with the three monotheistic religions” of Judaism, Christianity and Islam. Catholics and Jews must pray intensely that God would help bring peace, reconciliation, forgiveness and life to the Holy Land, the Middle East and all places where conflict and terrorism are sowing death and destruction. Interreligious dialogue, he said, must be based on a recognition that all people are children of the same God, who calls them to praise him and to work together for the good of all. Dialogue and respect are the answer, he said, and the pope’s visit to the synagogue is a sign of that.